LucasArts or Sierra: You could like both, but, more often than not, people tended to prefer one over the other in the golden age of adventure games. Though King’s Quest VI was my introduction to the genre (and the Windows operating system it was bundled with), Maniac Mansion, The Secret of Monkey Island series, and Full Throttle were the games I obsessed over and showed to visiting friends at any opportunity. Daedalic Entertainment began as an interesting experiment but has quickly become one of the most recognizable names in modern adventure games, releasing The Dark Eye: Chains of Satinav nearly a month ago and cult favorite The Whispered World a while before that. Its recent titles dealt with heavy subject matter and dark fantasy worlds that feel closer to Sierra’s flagship series. Yet, Daedalic got its start with silly, colorful games that imitated LucasArts. 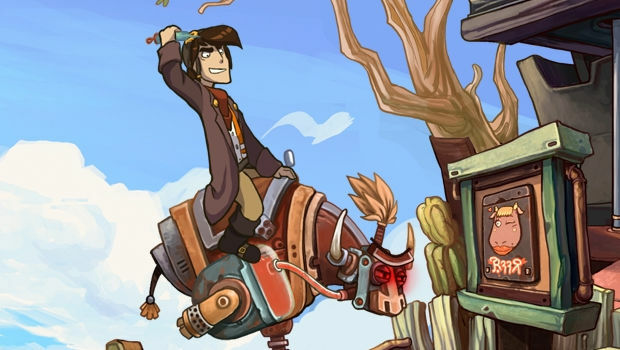 Deponia is the developer’s return to this style of adventure. Although it doesn’t hold up to LucasArt’s best, Deponia is a reminder of why some of us loved those games so much more than their contemporaries. 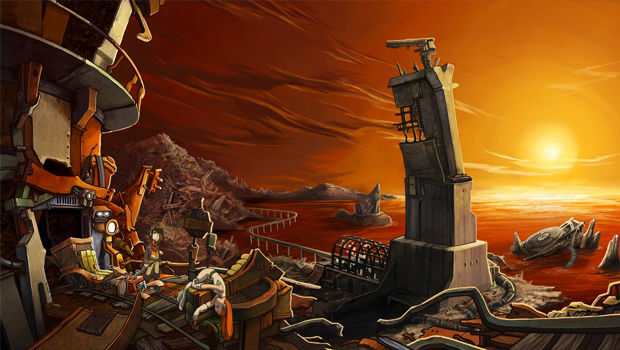 Deponia smells like garbage, because it’s a planet made of garbage. Its citizens have made this supposedly uninhabitable junkyard of a planet into their home. Everyone except Rufus. 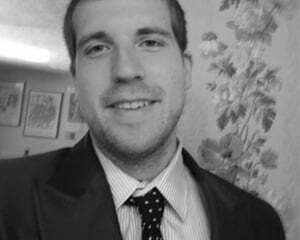 Deponia to him is nothing more than the planet that his father abandoned him on. Now, he wants to return to his birthplace far away in the sky. Deponia (the game) is a lot of things: It’s an adventure, romance, and comedy all wrapped up into one goofy story. Rufus is a confident dope who bears much in common with Secret of Monkey Island’s Guybrush Threepwood. While his ambitions are a bit less, he possesses a similar wit and cluelessness in any given situation. He describes himself as “a cool version of herpes” but his friends and neighbors on Deponia would leave out the cool part. Though he is sympathetic, it took me some time to become attached to him. The same can be said about the game as a whole. Deponia has a lot more in common with Secret of Monkey Island than just sharing a similar lead character. Everything from the dialog to the comically-driven puzzles recalls LucasArts’s classic. As a result, Deponia doesn’t feel all that fresh. It doesn’t help that the game has serious problems with pacing and puzzle design in its first act (the lengthiest of the three). Things are slow-going at first. The game soon gives you a lot of ground to cover in a large city hub, but you’ll run into some obtuse puzzles that won’t make much more sense once you stumble upon the solution. The logic behind some puzzles relies too heavily on a comedic mindset rather than that of a sensible human being. LucasArts perfected their craft over the years, learning when to leave comedy out of the picture for playability. Deponia isn’t quite so discerning in its use of comedy nor is its comedic chops quite as cutting. The game prolongs dialog with bad joke after bad joke, at times. I can appreciate the spirit but I expect an adventure game to be more sparing in its humor. When every dialog option with a character doesn’t tell me anything about the game’s plot or characters, I start to become disinterested. I can’t stress enough though that these problems are mostly restricted to the first act. Even the comedy becomes stronger in the following acts -- it’s a very odd thing that makes me wonder what the production process was like behind the game. Rufus’ life becomes complicated once his plans to escape Deponia end up with him becoming responsible for a girl named Goal. He accidentally incapacitates her and decides to find a way to make her regain consciousness, hoping that she’ll help bring him back to his father’s home planet. While Rufus has some depth, he is a self-serving character that is hard to root for until the game’s second half. 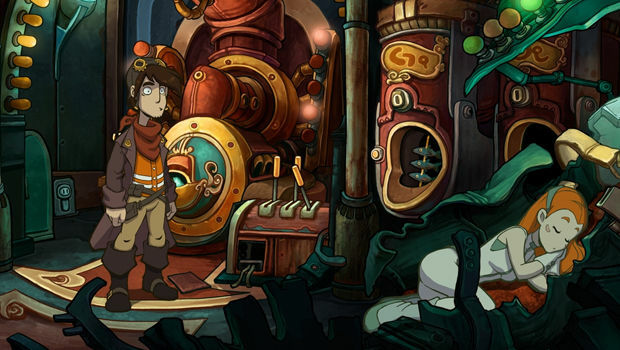 The main reason the first half sags, however, is that Deponia is kind of a miserable place. Rufus’ neighbors, ex-girlfriend, and even his best friend are all mean to Rufus and not very interesting characters. Despite Deponia being a rather nasty place, it's brought to life through a gorgeous hand-drawn aesthetic that recalls Curse of Monkey Island. The animation is very sub-par, with characters and backgrounds barely moving, but the design and art of the game’s locales are consistently interesting and eye-catching. Though the game is nice to look at, the dull animation is a constant reminder that this is developed by an indie with a modest budget. The same can be said of the English version’s hit-and-miss voice cast -- the game was originally voiced in German but there is no option to change to it. Thankfully Rufus sounds good and there are some quality performances later in the game, but it’s not top-caliber stuff. The grating voice effect on the game’s stormtrooper-esque Organon troopers is another chink in the game’s presentation. Despite a poor beginning and ending, I can’t shake off the warm feeling Deponia left me with. It’s a game with a big heart and some clever puzzles that recall a special time in the history of adventure games. 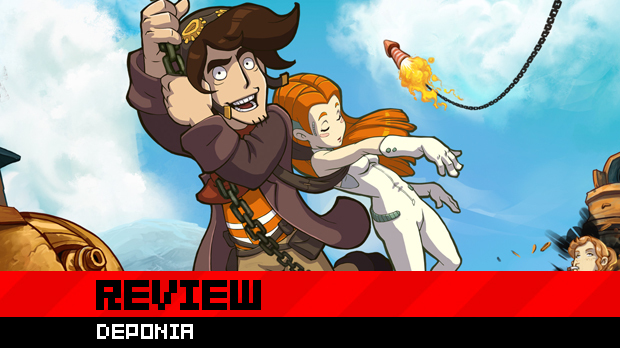 The game lacks the consistency, quality animation, and hilarity of Tim Schafer and Ron Gilbert’s work, but Deponia is a charming and creative adventure that stands above many of its contemporaries. You can deduce the game to being a tribute to the golden years of LucasArts, but isn’t that exactly what so many want right now?